Generic ‘canvas generator’ tool for Archi! As part of our work on the JISC funded Coeducate Project, Phil Beauvoir has developed a ‘blank canvas’ feature as an addition to the Archi modelling tool that offers open source software for Archimate modelling. A significant generic application of the canvas tool ( fully editable and lockable / un-lockable making them very powerful and flexible) is in support of face-to-face workshops. On creation, a new ‘canvas’ can also be exported as a .png or .jpeg, enabling it to be printed out on large A0 sheets. These can then be provided for workshops participants to use with post-its in the normal way. However, a rapporteur can additionally use the tool to capture the post-its as they are created, thus providing a record that can be shared, built on in future, &/or handled by other applications. 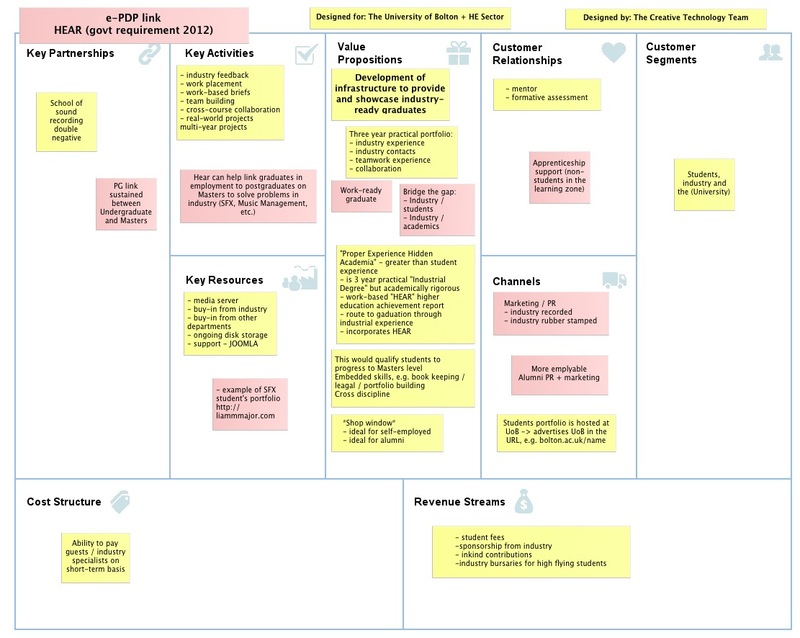 Our motivation for developing the tool was our use of the Business Model Canvas (BMC) which as its name suggests is designed to support thinking around business models, something that we are not particularly good at when we develop new degree programmes in the UK Higher Education sector. Rather than simply building a ‘hard wired’ representation of the BMC into Archi, we hope that we have added new dimension for people who wish to try and tie together different approaches and techniques with the practice of Enterprise Architecture using Archimate modelling language. An important point, is that this isn’t just a visual representation, but the tool (built in Eclipse) captures relationships between objects with associated name-value properties so that more can be done with the data in an automated way. We think this is a cool bit of work and expect to see the commercial vendors like BizzDesign following suit:^) Phil’s work will ship with the next release of Archi in early December 2011. This entry was posted in Learning thoughts on December 5, 2011 by Stephen Powell.